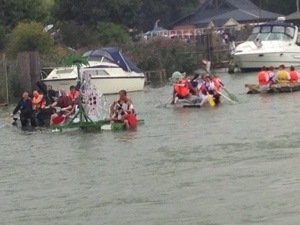 Just a few days ago, I was cursing the 32 degrees of hot sunshine in the south of France, but we would have loved to have had some of that yesterday for the annual Arundel Festival bathtub challenge. Lets start at the beginning. An excellent cooked breakfast was consumed by 11.30 and a tour of the shops in Arundel followed. Regular readers will know that I am less than enamoured with the whole concept of shopping as an entertainment but in this town, it is a very different proposition. Rather than and Primark, specsavers and various charity shops, Arundel offers such delights as the widely diverse as Sparks Yard, a very interesting and far from usual department store, where one can buy such items as leather handled champagne buckets, through to a walking stick shop, the contents of which I have long coveted. That Nice Lady Decorator tells me I am too young to contemplate owning a silver topped cane, but I have a very significant birthday coming up next January, and in the expected absence of a Rolls Royce Corniche Convertible or a Bentley Azure, and probably more realistically, I covert a silver topped walking stick. he fact that it could used to beat me may be the clincher. A less than brisk walk to The Black Rabbit in scudding drizzle followed, the torrential rain of the morning having cleared. There was however the promise of heavy showers, and sure enough, just as we positioned ourselves for the start of one of the highlights of the Arundel Festival, the Bathtub Challenge, the forecast proved irritatingly accurate and the heavens opened again. Some of us, and by that I mean the male contingent, braved the worst that England can produce on a summer afternoon, whilst the female contingent headed for home. Even That Nice Lady England Loving Decorator, who has a filthy cold and a vicious sore throat, must surely have seen the irony in her complaints that the summer in France has been too hot. Arriving back we were treated to a visit by the comedic Clive “Oh Yes he Is” Panto (his real name, well without the punctuation marks) and his beautiful wife Cathryn, who had managed to arrive after the start time and three hours later than scheduled. Very funny in his own mind, Clive makes his living as some kind of entertainer and team builder in the world of top corporate management. He thinks he is amusing and so do we, although often we are laughing at him rather than with him. Having despatched our guests, and put That Nice Lady Flu Sufferer to bed, I popped around to the White Hart for a debrief, where I ran into Arundel’s token Iranian, Naz, a charming and engaging chap I had met a few times before, who was nursing a loose tooth, which he blamed on the fantastic performance last evening of Screamin’ Lez and The Mindbenders. It seems that, overtaken by the moment, Naz had unaccountably decided it would be a tribute to the group for a pair of knickers to be thrown, Tom Jones style, onto the stage. He decided to take his own off without removing his trousers, but when the elastic proved to be a problem, he had tried to bite through it, loosening a tooth. This is yet another example of the dangers inherent in rock and roll. So far today, I have not mentioned the wonderful foreign exchange services of Currencies Direct. The reason is that it is a bank holiday weekend and I thought you all deserved a bit of peace, so you have been let off.